I know, I know... Valentines day is more than a month away, but in crafty world, it's kickin' into high gear. I like to decorate a bit for the "little" holidays. I think the kids like it and it adds some festivity to our home. I don't like to spend a lot of money on said decorations, however. 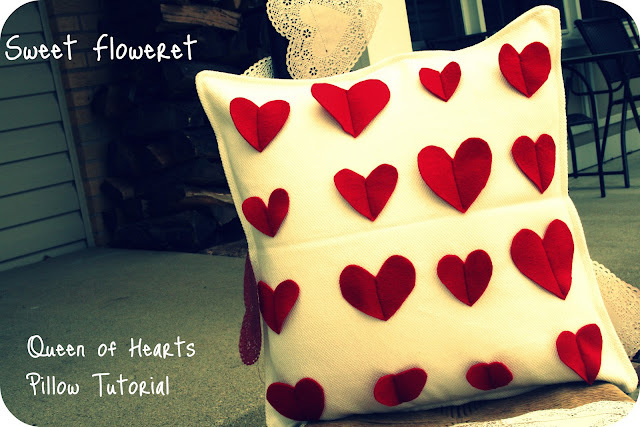 I saw a pillow on pinterest with felt circles and I thought, "well wouldn't that be darn cute with hearts?" In typical Tina fashion, I had to do it right then and there. It's a sickness really. Here I am 45 minutes later typing a tutorial for it. Make it stop!!! I had a pillow cover that I had picked up from Ikea a few months back. 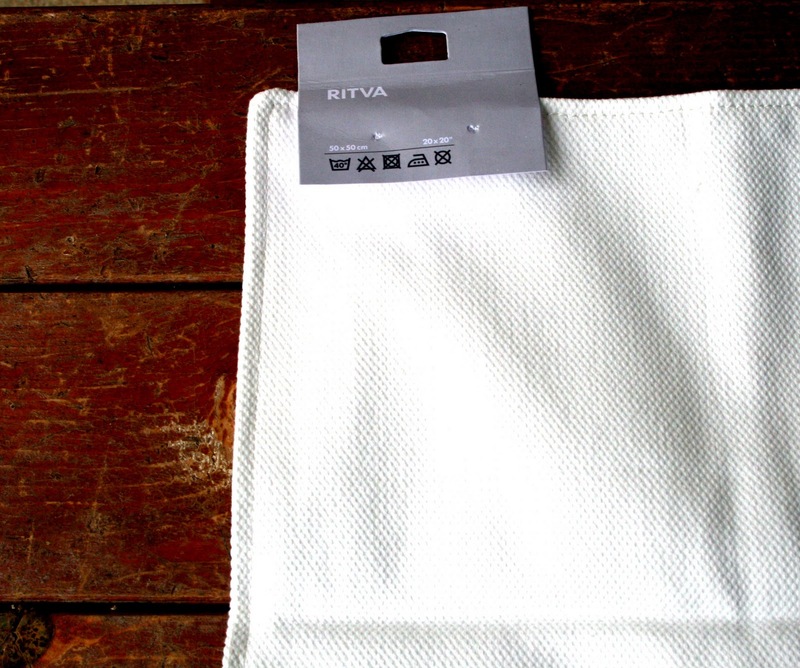 It's a white waffly 20x20inch cover. I also had some red felt. Here's what you need in case you want to make one for yourself! It took me approx 30 minutes from start to finish. Instruccione's: (Don't ask my why I felt the need to write that in Spanish. No lo se'). 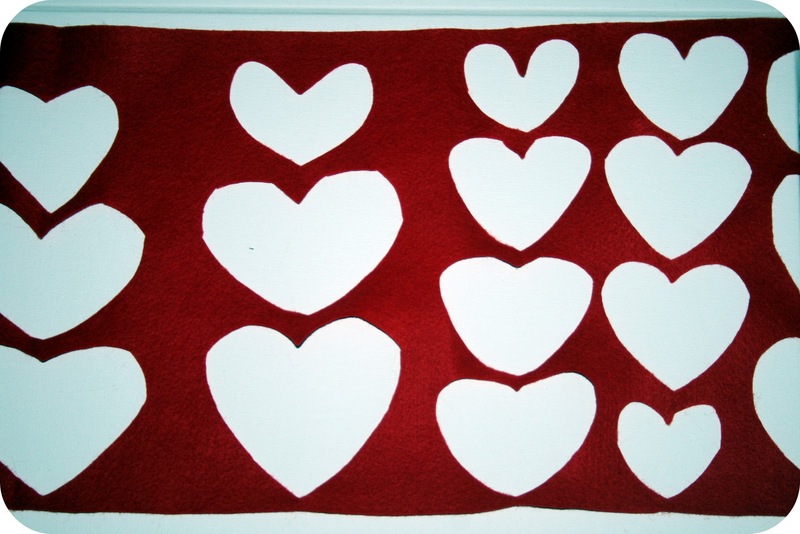 Cut 16 hearts out of the felt. I made mine different sizes because I knew I'd never be able to get them all one uniform size. I also used the old, fold in half to cut your heart method. While you're cutting, a great song to listen to is Bon Jovi's "Shot through the Heart" except you can change it to "Cut Through the Heart." Chuckle. Snort. 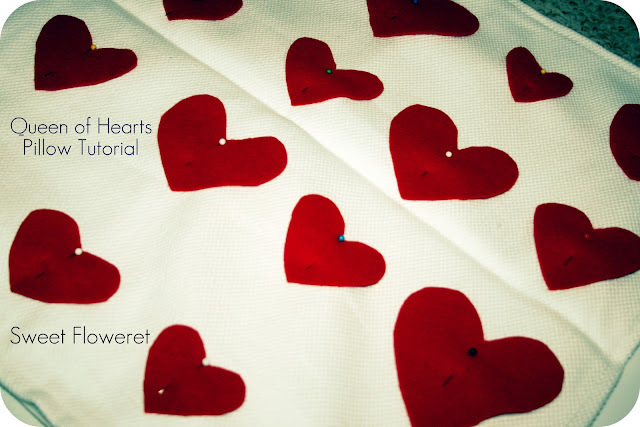 Sew up the middle of each heart backstitching at the beginning and end of each heart. Don't cut the thread after every single heart in one row. Just pull it along and cut all the thread at the end (see pic). It makes it go much more quickly this way! Load your pillow inside and viola! A cute addition to your Valentime's day decor (correct pronunciation for my three year old). Love it! Super cute!! I need to get started on my valentines decorations..I think I will haVe to do this! Came over from Tatertots and Jello...following you now and definatley going to check out your etsy shop! 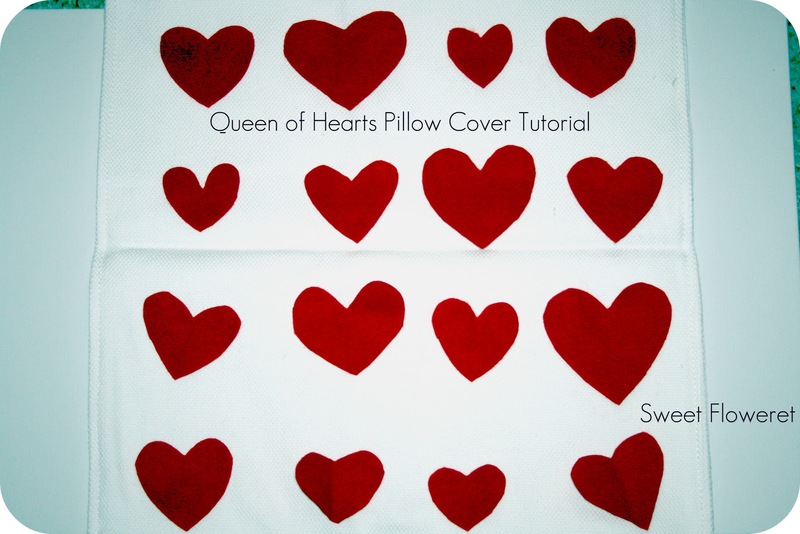 I think this is my favorite V-Day pillow yet! I'd love for you to link it up at Tell it to Me Tuesday! What an adorable pillow! I love it! I pinned it Tina and it instantly got repinned 16 times! Way to go girlfriend! I'm going to be featuring this on my FB page tonight! I'm featuring this tonight on Tell it to Me Tuesday! Come by and grab a button. Too cute. If only I was not totally terrified of my Brother (smile). Stopped by from Tip Junkie. Super cute and great tutorial!! Would LOVE to have you link up at our Uncommonly Yours link party!! Can you still wash it with the hearts stitched on to it? Or will the pillow turn out all pink afterwards? 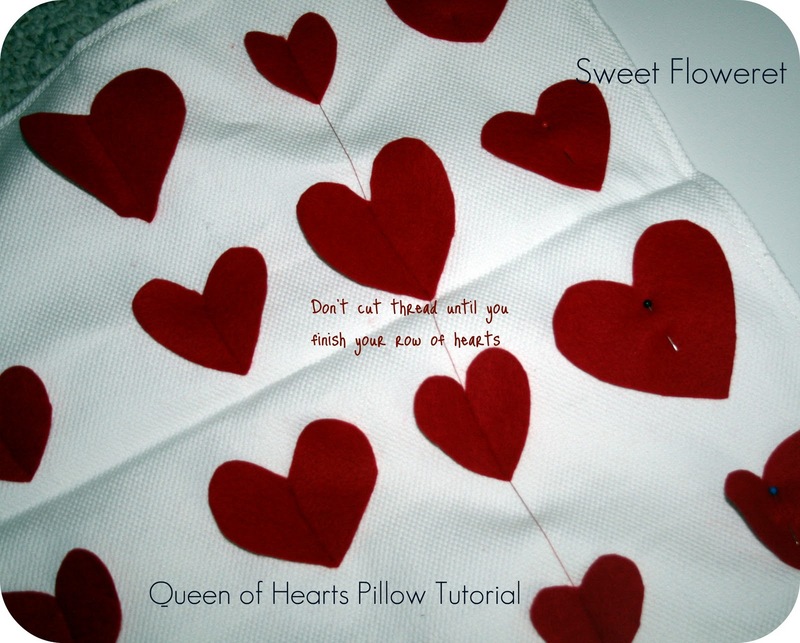 Such a sweet pillow for V-day. Great work! Glad I dropped by from the Etsy Blog Team. That pillow is so awesome to sleep on. I love the design and your choice of materials is great. I'm loving it.